Is this a Maiden Hair Fern? it isnt maiden hair fern but i cant think which one it is. is it an actual fern and not asparagus fern? if that makes sense. Asparagus sprengeri I think. A misnomer as fern is only applied for the "slight" resemblance to a true fern. The Asparagus group (there are a lot of them) use modified flower stalks as photosynthetic organs. This is a type of asparagus fern known as Emerald Fern - Asparagus plumosus or an alternative name is Asparagus setaceus. It's a perennial scrambler with fibrous rhizomes and roots with little greenish white, bell-shaped flowers- classed as a weed over here. Brilliant. I had looked under asparagus on the internet but couldn´t find anything. I´ve just posted a better pic of the plant in my other question. Can you help me there too. Many thanks. I guessed wrong Asparagus species, Doh! No probs, we got there in the end. Thanks All. Sorry, but every one of you have the wrong answer! 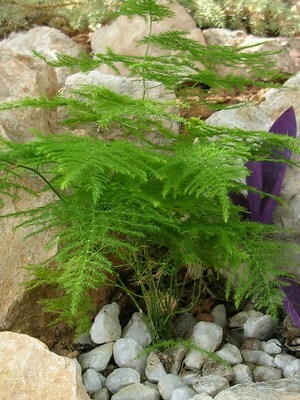 LOL This is a Plumosa Fern...and known in some areas as Asparagus GRASS, NOT Asparagus FERN. I'm sure this little variance in names is the reason for so much confusion. I'm just sorry that people have been seeing the posts on this page since 2009, and have been receiving the wrong information. But, Plumosa Fern is the correct answer!